Shutting off the water supply valve beneath a kitchen sink is the prerequisite to several common repair jobs, including faucet repairs and supply line replacement. 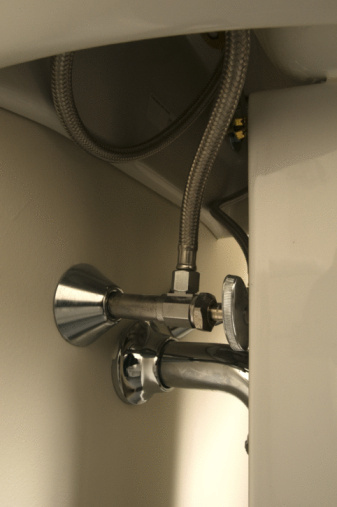 Kitchen sink supply lines connect to a small, in-line shut-off valve, sometimes called an angle-stop valve, at the rear of the under-sink cabinet. Essentially, these valves function like a faucet handle; they consist of a knob that turns both clockwise and counterclockwise to allow or prevent the flow of water through the valve's body. Shut-off valves are located beneath both kitchen and bathroom sink fixtures. Rotate the sink's faucet handle or knobs clockwise to turn the fixture to the off position. Open the under-sink cabinet's doors. Turn on a flashlight and shine the flashlight into the under-sink cabinet. Look beyond the sink's drain plumbing to the wall at the rear of the cabinet. Scan the wall for a set of metallic handles; sink shut-off valves have oblong or square-shaped handles. Because kitchen sinks have both hot and cold water shut-off valves, look for a set of two valves. Reach to the rear of the cabinet, grasp one of the valve handles and turn the handle clockwise. Turn the handle clockwise until fully tightened. Grasp the other valve handle and turn it clockwise until fully tightened. If it hurts your palm to grip and turn the handles, wrap a clean rag around the handle while turning. Open the sink's faucet handles to check that the water supply is shut off.